It was exciting to see my friend Darren's post today about the announcing of the 2007 Edublog Awards. He had the honor of telling me that Cool Cat Teacher is a finalist for best teacher blog this year and that the Horizon Project is a finalist for best wiki! (I'm not sure why I didn't get an e-mail from Josie, but I sent a quick message thanking her and included a description of my blog.) It is also exciting that TechLearning has been nominated for best group blog. Congratulations to all of the finalists! It is great company that I'm allowed to keep! I hope you'll review the nominations and vote! You'll also find some great reading in there for your RSS reader! Why it means so much to me! As I'm sitting here watching a JV basketball game (we're winning 39-12) and consider the ups and downs of life. I have three kids, two of whom have learning disabilities and two are in middle school... it is often tough to keep blogging when you're teaching a child to read and helping another one cope! And yet, when something really exciting happens, who do I want to tell? You! I remember when I had my second reader! (The first one was me!) It was on December 1st, 2005 (I later changed the date of the blog post to December 9th without knowing what I was doing!) that I first began blogging and in less than two years, I've been blessed with so many new people to inspire me and help me be a better teacher. I always say that I'm a "poster child" for the beginner and it is true. I'm a latecomer to the ballgame but so glad that I finally joined in! I'm proof that someone who knows nothing and no one can join in this technology revolution and not be too late. But really, a blog is a conversation and you have made this blog what it is! You've commented. (Mike Hetherington was my first.) You've encouraged me! You've kept me blogging when I really wanted to quit!! You twittered me when my grandmother passed away this summer and you have encouraged me this fall as we've been struggling with my son suffering the taunts of bullies. When Julie and I had a silly little dream to collaborate across the world, you stepped in to judge Flat Classroom 2006, Horizon 2007, and Flat Classroom 2007. You made those what they have become! The name Cool Cat Teacher was coined by my own students. The blog Cool Cat Teacher was made and sustained with your encouragement. It was feed by the organism called the edublogosphere. Whatever happens in this award, the meaning is this... when we connect, we all win. If you've gotten encouragement out of my blog, I'm so happy that my wins (and losses) can be to your benefit. But honestly, I wouldn't be around to comment if you hadn't gotten me through some really tough times. The good Lord has used you to encourage me through the darkest valleys of my life... and even one in which I'm walking right now. I'm saddened to tell you that I'm having to take a six week hiatus from the Women of Web 2 show, but plan to come back in January. It is about keeping my family first... and my children need me... and maybe some of you out there need to read the thoughts that I write here and often cry over. Writing on this blog is truly an emotional, soul baring experience for me. For on these electronic pages, you see the bits and bytes that make up my flesh and blood. I just want you all to know that I'm grateful. It is easy to look and see numbers, but I see each and individual person and to take part of your busy life to stop over here, read, and often comment... that is the greatest reward you give to me. It is not about the change in our pocket but about the lives we change. Thank you friends! I am very grateful for what you've made me! I want to know how this student on Flat Classroom made this video. It has links within it and an interactive survey at the end. These students often make me say, hmmm How did they do that? I particularly like the puppetcast at the beginning, how they cite their sources of information (look for the little boxes that pop up), and the discussion between a person playing Google and Yahoo and the Google Pink video at the end. I feel that this is future of HOW we will do video. Hyperlinked video citing sources. This is so far past what I've understood or even thought about but it is WHAT I'll be doing! We will be creating a standard for how student online video should be done, in fact it is happening now. And if you're not making video online, you'll not be a part. This is how innovation happens. Teachers point students in the direction, students run with it. Students pass teacher. Students point teachers in the direction. Teachers pass students (if the teacher is running with the pace of change.) And so on. I've been shopping today and yesterday and have found some things I think would be good for teachers. This is great for the teacher with kids. You press this onto the toast and magically the words "I Love You" appear on the toast. This handy list is great for teachers on the run! I couldn't get enough of these. Everyone, I mean everyone needs one of these. 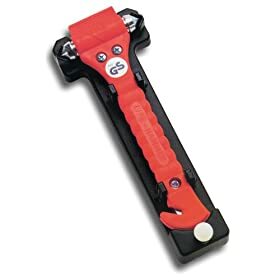 After watching the guys on mythbusters show how difficult it is to get out of a car while sinking, my husband got me one of these. It has one edge to cut the seatbelt and an edge of the hammer to break glass. I keep it beside my seat at all times on the middle dash secured with velcro. Every person who drives in our extended family has one. This is the descendant of one of my favorite presents from about three year's back. The gentlemen at work kept stealing my tools!!! I couldn't keep a phillips head screwdriver for more than a week. Until I got my pink toolset, that is. I love this because if your teacher is a "fix it" type teacher or just a computer teacher, these tools will always come back!! Any of the All Recipes Cookbooks . These are from my favorite cooking website. I have all of them and the recipes are just wonderful. 3M Post-it(R) Self-Stick Tabletop Easel Pad, 20in. x 23in., Plain White Paper $17.10 - I'm always running around doing things on other parts of the campus. You write on these and stick them on the wall! Awesome! Super Thick Sharpie Markers $2.63 - These very thick markers are wonderful and I use them ALL THE TIME! Bulletin Board Storage Bag $9.38 - These are so cool! Post it Note Flags $3.32 - I could never have enough of these. An ipod microphone (make sure you know what kind of Ipod they have this is the one for my 2 GB Nano-XtremeMac IPN-MIC-20 Micromemo Digital Voice Recorder for iPod Nano 2G (Black) ), an awesome Logitech Quickcam Fusion (my favorite) or even a good Altec Lansing AHS322 Stereo Over-the-head headset with microphone is helpful as is a Keyspan PR-US2 Presentation Remote for those presenting on the road. I've had people bring me homemade casseroles and cakes. I love things I can freeze for Christmas because most people don't realize that teachers are really stressed out in December with the end of the grading period. They want to give good things to their family but end up grading sometimes till 2 am. Sometimes a gift certificate to go eat out at a pizza place or in town is perfect. Also remember, if you give a teacher money and they have kids, it will rarely be spent on the teacher. So sometimes a gift certificate to a bath and body works or something is great. If your teacher uses candy in her classroom, get her candy. I just love those big bags of candy from Wal Mart because I spend at least $25+ a month on candy. Remember, it is not about buying an expensive gift! A $2 gift with a meaningful note is priceless to me. (Hey, I'd be happy with just the note!) I'm not in it for the money, otherwise, I'd be doing something else! Just being remembered means a lot and sometimes, you'd be surprised, teachers don't know it when they are a good teacher. Teaching is a toxic profession so say thanks! It is always in good taste to say thank you to those you are important in the life of your child. I'm coolcatteacher over there. But I must say, except for adding a twitter app (to post my twitter updates), and adding a delicious app, I'm sorely deficient on how to effectively use facebook. So, facebook fans, tell me, what are the groups I should join? How should I connect on facebook? What are your tips? I'm all ears and will post more later about what "I think." I don't know anything and need to see what you think. I am spurred forward because articles like the recent 14 year old girl's suicide caused by the creation of a fictious person on myspace has me greatly bothered and makes me feel that we as educators must begin to understand this world and create ways for kids to interact with us outside the "official" schoolhouse. Could someone have helped her? Again, this project has accelerated my students far past what any of us seven teachers could do alone. It is not something any one of us teachers can get our arms around or really take credit for. We are facilitators, the kids grow and learn like a moving, evolving organism of thought, excitement, and challenge. It is full of experiential learning, peer review, and learning by socialization. When a project gets this large, there is no tight fisted control. We are involved any time there are issues (had an accidental wiki war yesterday but taught the kids how to handle it and it is a non -issue at this point.) But every issue is a teachable moment for all of us. This sort of project is challenging, difficult, hard to imagine, and yet so incredibly rewarding. I believe that making connections is one of the most important things you as a teacher can do. "The connections are so important and certainly take a life of their own. No project goes “as planned” and no project is perfect, however it is in the imperfection of humanity we can see the beauty of the connections… hybrid flowers if you will that would have never bloomed without cross pollinization. Thanks for sharing!" What are you doing to bring your students near to a world that is half a world a way? On November 1st, I blogged about Moray in South Africa who needed to connect with some people who could help her! Thank you so much for helping me out. I have been put in touch with **name removed** who lives in Pietermaritzburg, about an hour’s drive from Durban, where I live. [She] was so accommodating and had material that I have been able to use and adapt to our special circumstances. We are getting along like a house on fire and should have everything completed by the end of this week. Something that initially looked like an insurmountable obstacle has suddenly become achievable. [She] also runs a marvelous phonics programme which I have discussed with our remedial teacher. We shall probably introduce something similar in the New Year. We have been given so many wonderful ideas and plenty of inspiration. Thank you once again for responding to my desperate plea. I am ever so grateful and should you ever think of visiting this part of the world, be assured that you will always be most welcome. When I corresponded with Moray asking for permission to use an excerpt from her e-mail, she said that the connection went from me to the UK, to elsewhere in South Africa until her contact was made. What an exciting thing to happen! They are getting along like a "house on fire." Sounds like Julie and I doesn't it. There is no "right" way to make a connection. Whether it is networking at edtechtalk or K12online or asking a blogger or joining Taking iT Global (which I highly recommend) make your connection and talk to others. Connect. Communicate. Share your vision, goal and objectives for your corner of the edusphere. I'm enjoying watching some of the flat classroom videos that are coming in today. We still have some students frantically working to meet the "lockdown" date of tomorrow (before judging begins). For the videos that are on youtube, I've created a playlist that I'll be adding those videos to. I'll also be posting to my delicious account as well. This project is challenging beyond belief for all of us. However, the payoffs are incredible as well. OK, I have students to go help! I play the song "I will survive" while paying bills or tackling any task that seems daunting or unpleasant to me, so this song was incredibly funny. I didn't get here early to ask permission to ustream. I'm sorry b/c this is a great one, however, ethically I don't advocate ustreaming w/out permission. This is a session about the tips and tricks for getting the most out of Windows Vista. That is under Folder Options in the control Panel. Folder Options views -- tell it to show the hidden stuff. If on the same list, you can go down on the advanced settings and check "Use check boxes to select items" so you don't have to use Ctrl -- it is a cool feature. For those who are technical. Look at the Last prompt "turn User Account Control Off"
Uncheck the box the box "use user account control (UAC) to help protect your computer. and click OK.
(But you don't need a new PC -- it just needs a 1GB processor or better. If you turn off the glitzy stuff it will run as fast as XP.) If you have a PC w/ onboard video, it doesn't work with Vista. If you are buying a PC get a separate video card with 128MB of RAM or more. System control Panel --> Advanced System Settings --> Performance and turn off glitz to make it faster on an old computer. Lets you take any flash memory and plug it into your laptop or desktop to use the flash memory as a disk cache -- Max 4GB -- if it can go to the flash memory, it is 100 times faster to do that. To do that -> Right click on Flash Drive, properties, ready boost tab, set space to reserve. A dialog bo pops up -- there is a new choice called speed up my system. It comes up with a seconary dialog (which you can also get by right clicking on the flash drive and go to properties.) Vista will use any amount as storage device. He has a 8GB flash key -- sets up 4GB for ready boost and the rest is for files and documents. It takes a moment, anything he commonly does Vista will copy on to the flash key and it will get it quickly. If you go to a computer store and you buy a flash key and you get one for $10, you're getting a slow flash key. You want to buy a name brand -- Lexar Jump Drive,etc. they are must faster flash keys and benefit Vista quite a bit. What happens if you yank the flash key while running -- it doesn't hurt Vista a bit. Interestingly, Brent is running Vista on a Mac using BootCamp. It grays out the screen take your pointer and let go and it clips it into a window. (Really really cool. Wow!) Save and copy it to another app. You can write on it -- HTML PNG GIF or JPG are the format options. Automatically organizes by date. You can also tag w/ any category that you want. You have to manually tag the images w/ what category that they fit (that is really really cool.) It makes your own photos searchable. You can also title any image. Double click any image and it takes it into a photo previewer. You can zoom, go full screen, you can start a slideshow. You can rotate, etc. Up at the top there is a Fix button, you are now in the photo editor which lets you do autoadjust, exposure, color, crop the picture, rotate the picture and fix red eye. It has a lot of things in there. Vista backsup up once a day. It takes 20% of your harddrive space for system restore and to backup your MyDocuments. Once a day. You may have many days in there, but when it hits all of your space, it deletes the oldest copies. So, you may have days or weeks in there. Right click and restore previous version. Properties. It is a new option in there and you should teach your users. Right click on it --> in the middle restore previous version -- it opens properties it searches it -- there is no backup if there is not an image to get (the image has never been changed.) If it IS changed, it is there. That is really cool. Get it yourself. You also have a choice to copy the backup w/ a different name so you don't loose it. Powerful. Dictate and correct documents, competition for dragon. It take s a brief setup, it has an excellent correction mode. He has switched from Dragon to the voice recognition in vista. You can literally unplug your keyboard and use your computer by voice. (So cool.) Very powerful voice recognition program. Dictation and correction is very easy. You can use a headset mike to dictate. This has changed radically and there is a new default format. The way XP burned is that it Mastered it. You collect the files and then write to disk. In Vista, there is a Live File system. The burn shows in folders. Still no ISO support. no Copy support. Use with XP and Vista only. Double click the new disc for format options. Microsoft wants you to think of the CD/DVD as a flash drive. Can't take live file system cd and put it in your CD player. You'll still want to use mastered when you want to take a cd or dvd to . OK, I just left my pocketbook in the other session. I'm running to go get it. Sorry I'm missing stuff! He showed the Did You Know 2 video. From audience response, many people have still not seen it. (Man version 2 of this video is really high quality!! Wow! I like that, we are living in exponential times. 1 out of 8 couples married in the US met online. I like BG - before Google. Thomas Friedman says that the real story of the dot com era was the fiber that was being laid during the dot com era. That is the story that few people understand. We're left with a legacy of the infrastructure of the way the world is working. *Alan has a backchannel however, twitter is down and I can't backchannel without people to "talk" to. Twitter would have at least 4-5 more people in this great presentation! This is an excellent overview of the book. Alan is doing a great job. If you want someone to understand the book, this is a good presentation to watch. The real story of Y2K had to do with the programmers working on this problem and where they were located. The methods set up to allow people in India to do the programming for this problem. *I keep trying to backchannel, but it is just me talking to myself. I like the idea of a facilitator. We'll see how it goes in my session! What skills are needed? Collaboration, processing, synthsizing, cross disciplinary thinking, global awareness, consuming and producing information. 1/4th of us in the class are getting more than 100 e-mails a day. Do students know how to process and weed through this sort of innundation of stuff. How do they decide what to do? What do they do? Synthesizing and cross disciplinary thinking. A special kind of individual to make connections to be able to see things that specialists on their own cannot see. How do we teach that? Global awareness -- Many students lack a fundamental understanding of the world. He is talking about their tandem learning approach... his daughter is learning tandem with their friends. His daughter was on skype and they practiced their language skills. AT the end the girl in France says "When can we have her over to play?" Didn't realize that her friend was half a world away. Global mindedness, and important principle. We need to start seeing students as consumers and producers of information. How many have students published on wikipedia? Research shows when students are publishing for a global audience that they approach the task differently. Students need to be well versed in navigating around things. How can they find things quickly? Be aware of what resources and how to get there. Credibility -- evaluating credibility. He cannot get the kind of information he needs for things. He's talking about wikipedia. These are critical skills and before Wikipedia it was hard to teach it. Wikipedia opens the door to evaluate the sources. Great example, a guy in the audience says, a great flatteners in his life was when he got a free encyclopedia on a CD-ROM with a pack of cheese. An encyclopedia used to be such a status symbol and people had to scrimp and save just to get it. And now you don't have to even buy the cheese. Information is almost becoming free. Most of what his students are learning will not be of any relevance in terms of the language. Have a computer to buy for my five year old. It will change over the next five years. He is a fan of teaching concepts not the specifics. We should teach concepts and fundamentals, the strategies of learning technologies. We must expose students to varied sources of information. As students get older, we want to flip the paradigms of teachers and learners. He is in the process of building a global language exchange. Building collaboration of languages. He has two classes where his students are posted in French and the students in France are posting on the wiki in English and there is a dialog that is beginning to exchange. He is talking about when he talked to my students. The importance of information filtering and time filtering. I have the google presentation and links to the slideshare slides there. Please join in. I need some backchannel facilitators -- if you'd like to come and answer questions in the backchannel, I'd love it. Twittero, Twittero, wherefore art thou twittero? Deny thy server and refuse to crash; or if thou wilt not, be but sworn to never crash again, and I'll no longer blog. Tis but thy server that is my enemy Thou art thyself, not a selfish crashing fiend. What's a Twittero? It is nor hand nor foot nor arm nor face nor any other part belonging to man. O be some other dependable service! What's in a server? That which we call our favorite service on any other server would smell just as sweet. So, twittero would, were he not Twittero called, retain that dear perfection which he owes without title, twittero, doff thy server, and for thy server, which is no part of thee, find a new stable platform so that we may flock to thy warmth. OK, I've got to work on my presentation for tomorrow. I will be ustreaming from 9:45 - 10:45 EST -- My Seatmate Lives in china: the imperative for global collaborative projects. "These arise from my own survey and other sources. Provide teenagers with practical strategies to help them avoid giving away private information. Encourage the use of social networking sites in school in order to train students in their proper use. Ensure that students fully understand that it is not easy to delete all traces of oneself from a community, because of comments left on other people’s blogs or profiles. Encourage teachers to join online communities for the purpose of CPD. The school could even have its own Ning community, or similar, for the exchanging of ideas and resources, and for virtual staff meetings. Taking part in an online community would help teachers to understand their students’ experience. Teenagers use social networking sites and similar Social networking sites in order to do school-related work. Therefore it may be a good idea to encourage popular social networking sites to provide easily accessible resources that students could make use of. Encourage social networking sites to make deletion of personal data a one-click operation, or as near to that as possible"
Thank you Terry for not only having opinion, but some good primary research. Now, we need to some extensive follow up research with larger more representative samples. Tomorrow my students will be presenting at the GAETC conference in Atlanta where they will be working on their Flat Classroom project videos LIVE. If you're there at the conference, stop by. If you're not there, you can be there anyway, I'm going to ustream so watch my twitter and I'll let you know when we go live! I'll also be teaching a class on wikis from 9am -12pm EST on Thursday, November 15 and plan to ustream and google present that. So, stop by, let me know if you'll be around and I'll watch for you! I'm so excited about Beth Kanter being on Wow2 tonight! It is going to be a treat. Beth is not only an expert at Web 2.0 nonprofit fundraising on the Internet (we'll talk about that too) but recently returned from a trip to Cambodia to teach 18-24 year olds how to blog in order to give them a voice. Wow! It is almost like teaching someone how to speak. Beth is what I call "a crossroads blogger" -- she is a person that knows many people in different "sections" of the blogosphere and I'm so excited about learning from her tonight. We're on at 9 pm EST at www.edtechtalk.com. My fundraising campaign to send a young Cambodian woman to college! One of my students shared this on our private Ning. I was grading tonight and feeling overwhelmed, but watching this gave me a mood boost and I thought you'd like it too. Let me ask you this... How often do you just laugh and be in the moment? So many times the problems we worry about never come to pass. Now, I the list-making Mama would never tell you not to plan, however, I find that I stress myself out way too much. So, do you feel better? As with the Alicia Keys hack, which was discovered Thursday by Exploit Prevention Labs, these pages try to install malicious software on the victim's PC. If the victim's software is not fully patched, this can happen silently, but if that fails, the sites will tell the victim that he needs to install a video codec. That file is actually malware, researchers say. In all cases, hackers used the same background, the same Web code and the same malicious payload. "It's the exact same hijack," Boyd said via instant message. But one difference has been the amount of pain experienced by the bands after they were hacked. While the Alicia Keys site was repaired and up and running on Thursday -- the same day that the problem was publicly reported -- smaller bands that have fallen victim to the hackers have had to restart their MySpace profiles from scratch." One band has been trying to get myspace to restore its backup to no avail! How to patch and keep one's computer safe. Hackers and ethics. The whole discussion. But how about this. Why not have students write their solution for this. What should happen? I find that if you find a topic that students are passionate about that they will write! Nominate your favorites for the 2007 Edublog Awards by November 21st! The edublog awards are open. Nominate your favorites in the following categories. The best edublog of whose primary purpose is to share information, links and resources. The best edublog kept by, for or about a library or librarian. The best edublog for providing hints, tips and support for your tech needs. The best edublog kept by or written about education and training in a business context. The best use of the audio medium in any form. The best use of the visual medium in any form. The best educational use of a wiki. The best educational use of any social networking service. The best educational use of any virtual world space. The best educational use of an open source platform. A special award given to an edublog that particularly deserves to be of note. Let me start by saying, I know I'll forget something, but here is my list. Blogger: This is where I blog. Yes, wordpress and typepad are "prettier," but integration with searches from Google is where its at and despite what folks say, nothing is integrated more tightly with Google Blog search and Google search than blogger. Period. If you're not found, you're not heard. So, if you use another platform, you'd better make sure you submit your URL to Google so you'll be found. Sources for content: Creative Commons Search and Youtube will turn up great sources for content or to add emphasis. When I get concerned about participating in group think, I pull myself out of the rut, I often go to Stumble upon, Digg, Twittervision, Flickrvision, or read the News at newsmap. It is so important to not only read IN education but also intentionally pull out of education and read other things. Don't think the "gurus" know it all. They don't. Sometimes they are wrong. Grassroots folks are important. I also read those who are writing about my work using my watchlist in technorati. (I also pay special attention to new bloggers, sometimes a comment from someone they've linked to will keep them going.) I also browse and read the tags I'm following in Education. Tagging - If you have read 10 Habits of bloggers that win, you'll understand the importance of tags. I use the Tag Editor firefox add on. Show Me Widget - This is a must use for bloggers. If you go to my blog and look on the left hand side, it shows you all of the places I communicate. Until the Open Social API takes hold, this widget helps others connect with you. I think that each of us should have two types of RSS readers: the visually organized RSS reader and our "power reader." It is about fast, easy access. We are so shaped by the information we surround ourselves with. None of us have any time, so setting up good RSS readers will pay big dividends in all areas of your life. I have two favorites for this. I start up using my iGoogle page which includes several of my favorite blogs (shhh I'm not telling), my Airset calendar, my weather, Google Groups. It also includes a tab for "work" which includes a quick view of my Google Reader, access to my Google docs, and my Google Notebook. I also have a tab for my own "fun" including movie times and ratings, ratings of top products from PC Mag, an RSS feed of the top videos on Google video and youtube (and no they aren't the same), a recipe of the day and a feed from Interesting thing of the Day and How Stuff Works. Netvibes - My Teacher Dashboard - I use this for grading ALL of my student work. All of the wiki edits and comments, RSS feeds from public student Nings, public student blogs, etc. are here. The way this RSS reader works is ideal for grading and just so easy. It is the one I teach my students. I have at least 10 tabs in here!! If you want to know how I set this up, use the free tutorial that I created over at Atomic Learning where I give you a behind the scenes tour of how I set this up. Of note to principals is how I follow the youtube videos, etc. that are posted with my school's name. I am now calling this my teacher "dashboard." I can dash over there and see everything at a glance, all new things, all issues, all comments... everything! iTunes - More people listen to podcasts on PC's than on their ipod. This free software is my best friend and companion many times. Mood is often affected by music and sometimes we don't need medication, we need music! (I wish more schools allowed kids to work with ipods on!) If I'm stressed, sometimes a little Jimmy Buffett, James Taylor, Indigo Girls, or even a Disney tune just snaps me right out of it! ipod - I always thought it was hype. It's not. My nano is with me. I have turned my most despised task of washing dishes and clothes into a joyous one, as I listen to the Wall Street Journal, Businessweek, anything from Twit TV (Leo LaPorte is da man!) , the shows at Edtech talk, the Bored Again Christian, or whatever podcast suits my fancy. I'm often adding and removing podcasts. Newsmap - The most efficient way to read the news. Period. My students (and family)- I have a private ning for all of my students. The Ninth graders also blog at youth voices. Flat classroom students blog and communicate over on their Ning. I read student work more than everything else combined (since I am a teacher) and I find that it refreshes me, gives me hope, excites me, teaches me, and makes me a better person and more focused teacher. When my students reflect on my classroom it is like an instant focus group. Why wait to survey them at the end of the year? If they are reflecting daily, you're learning daily what works. Del.icio.us - The best bookmarking and sharing tool. Period. I want to play with Diigo which integrates with Delicious, but for now, Delicious is it. Screen Capture - I've used CamStudio for screen captures, but have recently begun using Camtasia . I love it, however, if you cannot afford it, head over to the free Jing Project. I believe that screen capture is an essential skill. The reason that I love Camtasia is that the codecs are great, and it gives you the ability to render for just about any platform. Video Editing and Conversion - I use a smattering of products for this. For editing screen captures, I use the Camtasia Studio. When I want to green screen, I use Pinnacle Studio 10 (thanks Dean Shareski). A must own for anyone editing video is Quick Time Pro. It allows you to convert all kinds of video formats, grab still shots of video, and has a robust editing program in this deceivingly simple looking software. You can even rip mp3 files off of quick time videos and produce video for the iPod or iPhone. It runs around $30. But if you need to convert and want something FREE try Zamzar. It converts between all types of formats... even those nasty Open Office to Microsoft Word conversions. Other great multimedia tools that are Free, Windows Movie Maker, PhotoStory, VoiceThread, Slideshare (try slidecasting), Animoto, and my sister loves iMovie. Video for the Classroom - Of course, I'm one of the lucky ones who uses youtube in the classroom and do so at least twice a day. Nothing like video to pull them in! But, for longer videos and high quality teacher materials, nothing beats the united streaming service from Discovery Educators. This service has recently been provided for our teachers here and I've just finished training all of the teachers. From the word of a veteran teacher, "Finally a technology I can use." The videos are searchable by topic, grade level, and include standards, teacher guides, and quizzes. If your library is wasting money on DVD's, tell them to STOP and purchase united streaming. It is a must! For real collaborative projects and group meetings, Elluminate is my favorite. With the seven teachers for Flat Classroom it is IMPOSSIBLE to get us all awake at the same time, so we use elluminate for the 3-4 who can meet to get together and then we record it and send the recording to the others. They have an mp3 feature coming soon which will make it even more useful. You can use a vroom for free and Elluminate Live is free also. I believe every student should know how to use a live classroom environment such as elluminate. They WILL use it in college. Asynchronous Communications - OK, my name is Vicki and I love wikis. I can't help it. Is it any wonder? They are easy to use, have a super quick learning curve, and are trackable down to the comma. You can control editing and even make them private. As most folks know wikispaces is my favorite. Not that the other folks aren't great, but I KNOW Adam and the folks at wikispaces and when I have a problem it is solved in moments. They listen to educators and were one of the first organizations to offer ad-free services of any kind. I have my class wiki, the Flat Classroom Wiki, the Horizon project wiki, my cool cat teacher wiki for presentations, and the k12 wiki to train teachers. It is also important when collaborating globally to decide how you're going to connect the students. Our first project, we shared e-mails. Then, after experiencing it, we think that is not a good idea. Using a social network like Ning allows the students to communicate, and a comment on a student's page generates an e-mail nudge to come over to the Ning. It allows us to coach the process. Great tool! Cell Phone Tools - My new favorite is 4info.net. In fact, the other day I was talking about this in a conference and a man jumped up and said "I love you!" This handy service lets me subscribe to weather alerts for me. And I have it text me when a Georgia Tech ballgame ends. My son, who literally wouldn't leave the house on game day, gets a text message for EVERY SCORE CHANGE in a Georgia Tech football game. He went canoing two weekends a go and relaxed, knowing he'd know the score. I also use Google SMS- GOOGL - and have taught my students to use Google to translate, find directions, define words, and more. Another great service is Jott.com -- It is great for sending myself messages when I don't have a pen handy. I can blog from jott, but usually don't, my southern accent is a mess with Jott. I have used it to send messages to others when I can't get to a computer. Very useful! I also love Twitter on my cell. Not only can I twitter from cell, but I can receive direct messages on my cell phone. This meant a lot to me this past summer when my grandmother passed away, I received direct messages as condolences. It really helped me a lot. Word Processing - I still love Microsoft Word . The Microsoft Office is a must own for teachers. (Sorry open source guys.) The smart art feature is the best for teachers because it makes creating graphic organizers very easy. But don't write your blog posts in there or you'll trash your RSS feed. Google Docs is what I use for collaborative editing or writing for blogs. It is a great online office suite. Presentations - Although PowerPoint is the de facto standard, I often create in PowerPoint and pull into Google Presentations. And if you only use PowerPoint in your preso, you're missing out. You should pull in web resources AND video, which means going to the web. That is where google presentations is so handy. Drop in the link and those following online can go directly there. And remember to recruit a backchannel facilitator beforehand. Live Streaming - Although I'm testing a new service, uStream has still got it! Photo Editing - Guys, PhotoShop is the best. I know there is other stuff out there, but there are some things that I just have to find the money for. Webcam - I have a personal Favorite. The Logitech Quickcam Fusion and here is why. It has the most phenomenal avatars, so when you want your students to shoot video and do not want their face on the video, you can still do it. The videos range from princesses to leprechauns and it requires NO geekiness. Additionally, it clips to your monitor but can come off easily and be held for video that needs to be a little more mobile. This is one thing you cannot do with permanently affixed webcams. Web Browser - Firefox - Using the add in's firefox is literally MINE. It is customizable to everything I am and makes it easier to work. E-mail Tools -- I use Gmail and have a great new add in called Better Gmail that helps me follow the Inbox Zero principles that I'm following now. If you have Gmail and are using firefox this is a MUST DOWNLOAD! If I wasn't using Gmail, I would be using Thunderbird because of its ability to do templates. You've got to use power tools in your e-mail or your e-mail will kill you. I'm sure there are other things I'm using, however, I've been working on this blog post for 3 hours and its late and I need to go to bed! (And I probably missed a few typos too.) So, let me know what I've forgotten, will you?